IANTD Australia, has acquired the Air Sea Rescue Vessel, 02-109 for Archaeological wreck survey in Bass Strait. This historic patrol boat was designed during World War Two for patrol and rescue operations . Ex HMAS Air View (923) 02-109, is an American constructed 63 ft Miami class patrol boat powered by twin gasoline V12 630HP Hall Scott Defenders .This class of vessel is commonly referred to as either an ARB, ASR ,AVR or Crash Boat depending on which branch of the services they served in . Air View, US Navy Hull No C36283 was constructed in Newport Beach, California, USA, by established boat builders South Coast Company, Contract no -NObs1347 Bureau of Ships plan 603100 under license to the Miami Boat Building Company . Implemented by the war dept for the United States Navy ,Air Force and Army the model 314 was also supplied to the Australian ,Canadian, Dutch ,English, South African and Russian Naval Forces during and post World War Two.The Royal New Zealand Navy also acquired three model 152 63ft Miami Class vessels as US forces moved northwards to the Philippines late 1944.The Model 314 was the most common of all the types built at the various wartime small ship builders across the USA .With a crew of two gunners, two machinists, radio operator, coxswain and Commanding Officer this class of vessel served in forward bases . In 1944 Air View's manufacture cost was $100,000 US dollars or 30,000 pounds ,the equivalent of 1.4 million Australian dollars today. With the American 5th Air Force front line, advancing towards Japan , Australia took over the role of Air Sea Rescue operations in August 1944 in what is now Indonesia, Malaysia,Borneo and Papua New Guinea. Vice Admiral Thomas C Kincaid C-in-C of the American 7th fleet ,which was formed in Brisbane Australia on 15/3/43 approved an RAN request for vessels. The United States Navy sponsored the RAN request for 20 Miami Class fast patrol craft.These craft were acquired through the US Bureau of Ships local production run of wartime boat builders on the west coast California USA . Ordered on 4/3/44 Order No BAD(AUS)2714 'Air View' RAN pennant number 923 was transported on the vessel "MV Laponia" as deck cargo to Australia. This Patrol boat was delivered in Sydney to the Royal Australian Navy in June 1944. 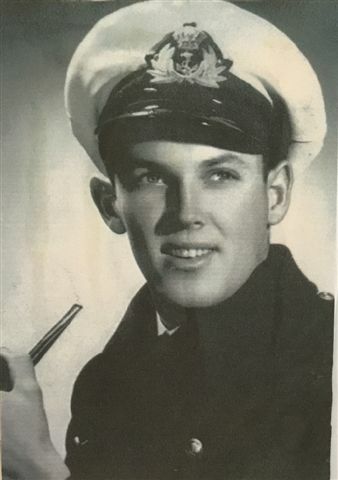 She was commissioned on 20/11/44 with her first skipper Sub Lieutenant Lowell K Williams RANR (photo below) .All of the Australian Miami Class were named with the prefix "Air" such as Air Save ,Air Mercy,Air Hope,Air Faith,Air Watch etc. This Patrol/Rescue boat was originally designed as a Submarine Chaser by boat designer Dair Long of the Miami Boat Building Company. The 923 "Air View" served in Northern Australia's forward bases along with 19 others of her class supplied under the WW2 lend lease agreement with the USA. Vessels of this type also operated from Australia at locations such as Balikpapan Borneo , Papua New Guinea and Dutch East Indies . The efficient rescue of Allied Airmen and Sailors was of vital importance. In some cases these vessels took the Japanese surrender in those areas. Due to their voracious appetite of gasoline they were often towed on long ocean journey's by Bathurst Class Corvettes to forward bases or stowed as deck cargo on transport ships. By the end ot the war in 1945 the Australian Navy had in excess of 300 small ships of various designs and sizes .Due to this excess most were sold off at disposal sales however a select few were kept such as the 63ft Miami Class boats . Air View 923 was transferred to the Marine Section of the Royal Australian Air Force in 1949 from the RAN where her pennant number changed to the 02-109 not to be mistaken for John F Kennedy's PT Boat the 109. The Air View served throughout Australia's RAAF Bases for the next 35 years from Melbourne to Darwin . In 1985 the vessel was laid up for disposal in Newcastle New South Wales as the Federal Government disbanded the RAAF Marine section which had been in existence since the RAAF was formed on the 31st of March 1921 . After 41 years of continuous service with the RAN and Raaf Marine Section Air View was disposed of in late 1985 to a private buyer a Mr G Board an ex WW2 test pilot .She was the very last World War 2 patrol boat out of the original 20 ordered in 1944 in service .In the intervening 26 years until IANTD's purchase she had just two owners one in Brisbane and another in Sydney.Used as a pleasure cruiser she was well looked after. Although most have long since disappeared, Air View, constructed of Honduran Mahogany, is one of only a handful of these uniquely designed, fast planning hulls like the famous American WW2 PT Boats to survive today. Because of their similar appearance Crash boats portrayed PT Boats in many WW2 movies because of the post war destruction of many PT Boats .These craft are a testament to the quality of workmanship that the Allies demanded in the dark days of WW2. Built for speed and excellent handling, these 63 foot rescue patrol boats or ASR's as they were designated, saved many lives during and after World War Two.Attached to flying boat squadrons which flew Catalinas and Martin Mariner flying boats the rescue of downed pilots was one of their main roles..Miami Class boats also served in the Korean War in the 1950's. Two of these vessels,Air Nymph ("Save") and the Australian built "Air Sprite" rescued many of the crew after the Voyager disaster in the early 1960's. The Aircraft Carrier HMAS Melbourne, sliced the Daring Class Destroyer HMAS Voyager in half off the coast off New South Wales on the 10th of February 1964 with the loss of 82 lives out of a crew of 314 . More modern Helicopters eventually made the role of Air Sea Rescue boats redundant in the latter part of the 1960's. The advent of improved diesel technology spelled the end of the high octane marine V12,s such as Packard,Hispano Suiza,Allison,Merlin and Hall Scott to name a few. The Hall Scott motor company V12's production was discontinued in 1959 after the company was incorporated into Hercules,however most Naval forces worldwide still used them in Air Sea Rescue Boats and 112ft Fairmiles until the early 1970's because of their high power to weight ratio using new old stock parts bought in the late 1950's.In Air Views case up until late 1985. The new owners post RAAF installed diesels for economic reasons . With thorough maintenance Hall Scott V12's are a robust highly powered gasoline engine that produce in excess of 630 hp each.A marine fitter is required in the engine room to monitor the engines while underway. Air View is still fitted with her original 1500 gallon self sealing fuel tanks that gave her a range of 630 Nautical Miles at a speed of 20 Knots and 470 Nautical Miles at 30 Knots. This vessel is currently undergoing restoration. In February 2013, her original super structure was reinstalled with a canopy to protect the hull. In August, 2014,new factory Hall Scott, 1260 hp Gasoline V12 motors were also installed.These were acquired as engines "pickled' by the American and Australian Naval forces after WW2. 'Air View' is the only Miami Class to have her original Hall Scott V12's in the Southern Hemisphere. Below is a picture of Air Views' Hall Scott V12's installed. Her second Skipper RAN Commodore Bryan Cleary (Deceased, link attached ) took command of her in 1946 and described her as a "Wonderful Little Ship" . Air View has recently been listed with the Australian Register of Historic Ships as one of the few if not the only original WW2 Australian crash boat . IANTD Australasia In conjunction with Southern Ocean exploration has discovered and mapped wrecks on Australia's southern coastline such as the "Coramba","Glenelg" and "Alert" with more projects in the pipeline . On the 31st of October 2015 Air View was taken out for her first sea trials in Western Port Victoria. With the forecast of variable winds and light showers it was decided that conditions were perfect. The new hydraulic servos were fitted as in the past the gears were engaged manually and a new charging system of alternators instead of generators were also fitted and working . As the mooring lines were cast off a sense of excitement was felt around the boat. As we eased her into the channel the gear boxes were engaged into forward and Air View slipped into Watson's inlet at 10.00 am sharp at 5.9 knots .Idling for the two kilometer channel run to deep open water the engines were checked for any issues that may have arisen,water ,fuel and oil pressure etc. The Hall Scotts massive power was felt as soon as the throttles were opened. The boat immediately responded with the speed increasing from and an amiable 5 knots to 14 knots within seconds .It is to be noted that her maximum speed with the old diesels was 10 knots at 75 litres an hour . Our maximum cruising speed for this trial was planned at 14 knots .The unmistakable note of the twin V12 exhausts was heard all round the bay . After an hour of trials we headed back to home port for some light refreshments where some minor adjustments will be carried out over the next weeks . The conclusion was that indeed even after 72 years Air View only one month shy of her original commission in November 1944 is still capable of achieving somewhere near her original performance of 33 knots with her Hall Scotts, however a cruising speed of 15-20 knots is economically more plausible . Like many of the boats and ships that were built with a limited wartime lifespan during the second world war it is thanks to Air View's previous owners and original construction that have enabled her to survive to the 21st century. .
More Images in the Photo Gallery Section.Attached are some links regarding Air View and a film from the Australian War Memorial depicting an ASR in Port Phillip Bay in 1963 welcoming the Royal Yacht Britania. 1,032,254 Unique Visits Powered by PHP-Fusion copyright © 2003-2006 by Nick Jones.